The Hickory Ridge Concert Series kicks off the new year with the duo Last Acre at the Dickson Mounds Museum near Lewistown, IL. 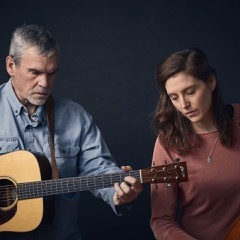 Known for their original songs and tight family harmonies rich with the elements of folk, bluegrass, and Americana, Last Acre is the father daughter duo Mark and Molly Mathewson. Molly Mathewson grew up in the bluegrass and folk music community in Springfield eventually moving to Chicago to pursue her career as an actor and writer. She has performed with various indie/folk projects since her teen years. Mark has been a regular in a wide range of folk and bluegrass bands in the Central Illinois area most recently appearing at Hickory Ridge last July with the bluegrass group The Burr Oak String Band. His songs have been recorded by a number of bluegrass acts, including Blue Highway, The Lonesome River Band, Ernie Thacker, Kenny Smith, Mark Newton, and Josh Williams. He is a winner of the Chris Austin Songwriting Contest (Merlefest). The Hickory Ridge Concert Series is hosted by singer-songwriter Chris Vallillo. Concerts are held the 3rd Saturday of every month and begin at 7:00 p.m. with the doors opening at 6:00 p.m. Coffee, drinks, and a variety of desserts are available during intermission. There is an admission charge of $8.00 per adult and $5.00 for children under 12. For the full schedule go to www.hickoryridgeconcerts.com.